The Rugby Football Union (RFU) is the governing body for England national team and educates and trains players and officials. The RFU is an Twickenham Stadium, London. Collins, Tony (2009); A Social History of English Rugby Union, Routledge. ISBN 978-0-415-47660-7. ^ "Beaumont appointed RFU Chairman". RFU.com. Retrieved 11 July 2012. ^ "Careers and Vacancies at the RFU". Rugby Football Union. ^ "International Rugby Board - England". International Rugby Board. ^ "Rob Andrew's role at RFU scrapped in overhaul". BBC News. 2011-01-06. Retrieved 2014-07-29. Re-excommunication: cartoon by J. M. Staniforth. The RFU is represented as a religious cabal, expelling Arthur "Monkey" Gould from their "church" over the "Gould Affair". Gould, in his Newport jersey, appears unconcerned. In 2003, the RFU began talks about a merger with the governing body for women's rugby union the RFUW. After five years of discussion it was announced that the two bodies will "integrate" (rather than merge) from September 2010, with the RFUW remaining in existence as a "Constituent Body" within the RFU. The RFU agreed to the formation of a league pyramid in 1987. The RFU long resisted competitions and leagues fearing that they would encourage foul play and professionalism. The first club competition, then known as the R.F.U Club Competition first took place in 1972. Following a sponsorship agreement it became known as the John Player Cup in 1976. 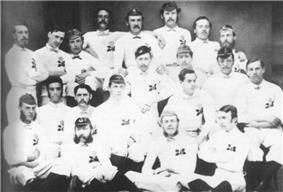 Twenty two rugby clubs from across the north of England met on 29 August 1895 in the Northern Rugby Football Union (later renamed the Rugby Football League). The RFU took strong action against the clubs involved in the formation of the NRFU, all of whom were deemed to have forfeited their amateur status and therefore to have left the RFU. A similar interpretation was applied to all players who played either for or against such clubs, whether or not they received any compensation. These players were barred indefinitely from any involvement in organised rugby union. These comprehensive and enduring sanctions, combined with the very localised nature of most rugby competition, meant that most northern clubs had little practical option but to affiliate with the NRFU in the first few years of its existence. Although similar unions were organised during the next few years in Ireland, Wales, Scotland, New Zealand, Australia, France, Canada, South Africa, and the United States, the RFU was the first and therefore had no need to distinguish itself from others by calling itself the English RFU. 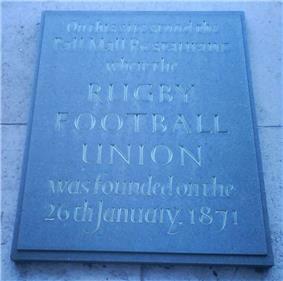 As a result of this meeting the Rugby Football Union (RFU) was founded. Algernon Rutter was elected as the first president of the RFU and Edwin Ash was elected as treasurer. Three lawyers who were Rugby School alumni (Rutter, Holmes and L.J. Maton) drew up the first laws of the game which were approved in June 1871. The 21 clubs present at the meeting were: Blackheath (represented by Burns and Frederick Stokes, the latter becoming the first captain of England), Richmond, Ravenscourt Park, West Kent, Marlborough Nomads, Wimbledon Hornets, Gipsies, Civil Service, The Law Club, Wellington College, Guy’s Hospital, Flamingoes, Clapham Rovers, Harlequin F.C., King's College Hospital, St Paul's, Queen’s House, Lausanne, Addison, Mohicans, and Belsize Park. The one notable omission was the Wasps. According to one version, a Wasps' representative was sent to attend the meeting, but owing to a misunderstanding, was sent to the wrong venue at the wrong time on the wrong day; another version is that he went to a venue of the same name where, after consuming a number of drinks, he realised his mistake but was too drunk to make his way to the correct venue. On 4 December 1870, Edwin Ash of Richmond and Benjamin Burns of Blackheath published a letter in The Times suggesting that "those who play the rugby-type game should meet to form a code of practice as various clubs play to rules which differ from others, which makes the game difficult to play." On 26 January 1871 a meeting attended by representatives from 21 clubs was held in London at the Pall Mall Restaurant on Regent Street.